ECO 286 is compound with Urea, Mono ammonium Phosphate (MAP), Potassium Sulphate (SOP), Magnesium Oxide (MgO), Tea Seed meal, Castor Seed meal and Palm meal using special technique. Except providing Nitrogen fertilizer, Phosphate fertilizer and Potassium fertilizer which plants needed for growth, ECO 286 combine both quick-acting and slow-acting effect and it can better meet the demand of crops growth. ECO 286 is suitable for different kinds of crop such as paddy, corns, leaf vegetables, fruit vegetables, melon and fruits, root fruit, fruit trees and different types of soil. Base fertilizer: according to crop kinds and soil condition, 400-1000kg/ha. 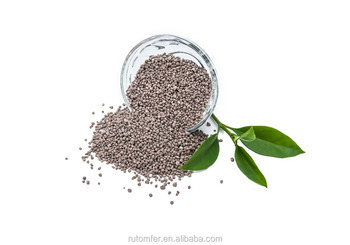 Dressing fertilizer: according to crop kinds and different growth periods, 100-400kg/ha. ECO 286 Organic-Inorganic Fertilizer is made of special formulation of high quality plant and animal row material and none chlorination chemical material, produced using unique granulating technology. ECO 286 Organic-Inorganic Fertilizer can not only meet the nutrient needs of crops growth period but also add organic matter to soil to improve the granular structure. No need to adjust fertilization habit while using ECO 286 Organic-Inorganic Fertilizer to achieve both yield increase and soil improvement. ECO 286 Organic-Inorganic Fertilizer added additional magnesium to supply medium elements for crops, it can raise the photosynthesis efficiency to achieve yield increase and quality enhancement.